Welcome to Today@WKU, the daily newsletter from WKU Public Affairs, for October 1, 2018. WKU recognizes 2018 Family of the Year: The family of WKU senior Stefani McCoy, a first-generation student from Elizabethtown, was recognized Saturday as WKU’s 2018 Family of the Year. 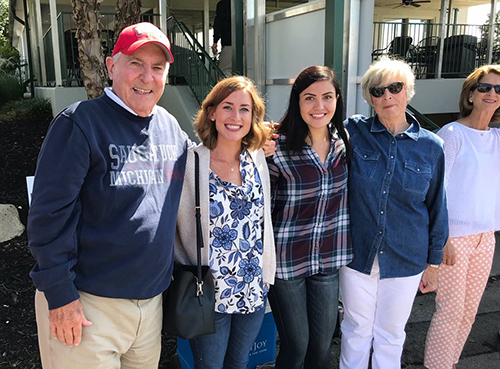 McCoy, who will complete her Bachelor of Science in Nursing degree this fall, was joined by her mother, Juanita McCoy; her father, Steve Tabor; her aunt, Anita Sonner; and her uncle, Ronnie Sonner, during WKU’s Parent and Family Weekend activities. James Stewart “Jimbo” DeVries Golf Scramble celebrates 20th anniversary, announces new scholarship recipients: The 20th annual James Stewart “Jimbo” DeVries Golf Scramble was held Friday at Crosswinds Golf Course in Bowling Green, Ky. Proceeds from the Jimbo DeVries Golf Scramble support the James Stewart “Jimbo” DeVries Scholarship, and the new scholarship recipients were announced at the event. “Fake News” the topic of forthcoming issue of the Journal of American Folklore: The Editors of the Journal of American Folklore (JAF), currently based in the Department of Folk Studies and Anthropology at WKU, are pleased to announce a forthcoming issue on the topic of “fake news.” The issue is composed of papers presented at a series of four pre-organized panels that examined multiple aspects of “fake news” at the 2017 Annual Meeting of the American Folklore Society. 2018 Annual Campus Safety and Security Report: The 2018 Annual Campus Safety and Security Report is available on the WKU Police website. In addition to crime and fire statistics for 2017, this report also details policies about the police department and how to report fires and crimes to the police. This report also provides information from the Department of Environmental, Health and Safety on campus fires and fire safety. Bill Sanders' Cartoon from Library Special Collections on exhibit at U.S. Capitol: A political cartoon from the Bill Sanders Cartoon Collection is part of an exhibit titled “Congress and the Separation of Powers” in the U.S. Capitol Visitors Center, Washington, D.C. The show will run through March 31. The Bill Sanders Cartoon Collection is housed in Library Special Collections at WKU. Volleyball: Three Lady Toppers Hit Double-Digit Kills in Four-Set Loss to Rice: Despite three Lady Toppers posting double-digit kills on the day, WKU Volleyball dropped a hard-fought four-set battle to Rice on Sunday from E.A. Diddle Arena. Rachel Anderson (13), Lauren Matthews (13) and Sophia Cerino (10) all finished with double-digit kills while Darby Music (18) and Payton Frederick (11) added double-digit digs. Next: WKU at Marshall on Friday. Football: Comeback Bid Falls Short in WKU Loss to Marshall: Trailing 20-17 in the final minutes, sophomore quarterback Steven Duncan connected with sophomore receiver Jacquez Sloan for 60 yards to put the Hilltoppers within striking distance, but a Marshall forced fumble two plays later derailed a furious comeback effort as the Hilltoppers fell to the Herd on Saturday night. Next: WKU at Charlotte on Oct. 13. Soccer: WKU Ends Road Trip With 4-0 Defeat at Old Dominion: Old Dominion scored three goals in the final 17 minutes of play as WKU fell, 4-0, at the ODU Soccer Complex on Sunday afternoon to end its five-match road trip. Next: WKU vs. FIU on Friday. Tennis: Lady Toppers Wrap Up Play at Purdue Invitational: WKU finished play Sunday at the Purdue Invitational in West Lafayette. Three Lady Toppers competed over the course of the weekend in both the doubles and singles brackets. Next: WKU will return to action in November when the Lady Toppers compete in their final fall tournament of the season at Chattanooga. Men’s basketball: Stansbury Sees 'Exciting Things Happening' as Tops Begin Practice: The offseason can be chaotic, but WKU Hilltopper Basketball head coach Rick Stansbury knows most of his time going forward will be on the court with his team. That's just fine by him. "This time of year, starting now, I like because I know where I'm at every day," Stansbury said. "That's the easiest part of coaching. I like being with our team. I like every day being able to go out and compete, especially when you like the young men you have on your team." Cross country: Webb, Wells Lead WKU at Louisville Classic: In its lone meet in the Bluegrass State this season, WKU Cross Country saw Emerson Wells and Haley Webb lead their respective squads at the Louisville Cross Country Classic on Saturday. As a team, the Lady Toppers finished 31st in the women's 5K Blue race while the Hilltoppers placed 38th in the men's 8K Blue race. Next: WKU at Evansville Invitational on Oct. 13. Tops go into bye week reeling from close losses: WKU heads into its bye week searching for good fortune, wondering when a few breaks will go its way. After five games and four losses, three that have come each by three points, the Hilltoppers (1-4) have to turn things around in a major way to get back to the postseason. They’ll need to end the year at least 5-2 to reach bowl eligibility for the eighth straight season.